This week we will be getting 4 inserts: A SmartSource, 2 RedPlums, and Proctor & Gamble! Make sure you take a look at the preview to determine how many papers you want to purchase. https://savvywifehappylife.com/wp-content/uploads/2016/09/SavvyWifeHappyLife-logo-2.png 0 0 Brandi https://savvywifehappylife.com/wp-content/uploads/2016/09/SavvyWifeHappyLife-logo-2.png Brandi2014-01-24 22:51:582014-01-24 22:51:58Sign Up for Gift Hulk (Rewards Site for Paypal and Amazon Gift Cards)! Swagbucks is a place to earn prizes, like Amazon gift cards, by earning Swagbucks through random searches, surveys, polls, games, TV, and special offers. Just spend a few minutes a day on Swagbucks and you’ll have a few Amazon gift cards before you know it! I’ve earned hundreds of dollars from Swagbucks. https://savvywifehappylife.com/wp-content/uploads/2016/09/SavvyWifeHappyLife-logo-2.png 0 0 Brandi https://savvywifehappylife.com/wp-content/uploads/2016/09/SavvyWifeHappyLife-logo-2.png Brandi2014-01-24 22:46:512014-01-24 22:46:51It's Mega Swagbucks Day! Get Free Amazon Gift Cards! Amazon: Star Trek on DVD just $2.99 (Reg. $35)! 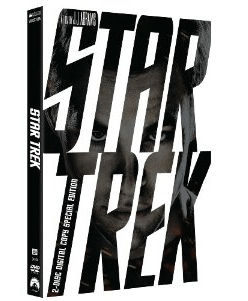 Amazon has Star Trek (Two-Disc Edition) for just $2.99 shipped (regularly 34.98)! That’s an excellent deal and it won’t last long, so buy it now if you’re interested. https://i2.wp.com/savvywifehappylife.com/wp-content/uploads/2014/01/Screenshot-2014-01-21-at-4.10.35-PM.png?fit=248%2C301&ssl=1 301 248 Brandi https://savvywifehappylife.com/wp-content/uploads/2016/09/SavvyWifeHappyLife-logo-2.png Brandi2014-01-21 16:12:372014-01-21 16:12:37Amazon: Star Trek on DVD just $2.99 (Reg. $35)! https://savvywifehappylife.com/wp-content/uploads/2016/09/SavvyWifeHappyLife-logo-2.png 0 0 Brandi https://savvywifehappylife.com/wp-content/uploads/2016/09/SavvyWifeHappyLife-logo-2.png Brandi2014-01-17 13:10:012014-01-17 13:10:01Sign Up for Gift Hulk (Rewards Site for Paypal and Amazon Gift Cards)! https://savvywifehappylife.com/wp-content/uploads/2016/09/SavvyWifeHappyLife-logo-2.png 0 0 Brandi https://savvywifehappylife.com/wp-content/uploads/2016/09/SavvyWifeHappyLife-logo-2.png Brandi2014-01-17 12:54:102014-01-17 12:54:10It's Mega Swagbucks Day! Get Free Amazon Gift Cards! New Coupon for $1 off Simply Orange Juice! Don’t forget to print this great coupon for $1.00 off one Simply Orange, any variety! We rarely see high value coupons for Simply products so this will surely come in handy with a sale at your local grocery store. If you’re local, Glen Burnie, MD ShopRite will double this coupon to $2 off! https://savvywifehappylife.com/wp-content/uploads/2016/09/SavvyWifeHappyLife-logo-2.png 0 0 Brandi https://savvywifehappylife.com/wp-content/uploads/2016/09/SavvyWifeHappyLife-logo-2.png Brandi2014-01-17 12:15:432014-01-17 12:15:43New Coupon for $1 off Simply Orange Juice! YAY! SavingStar is offering some really hot promotions! 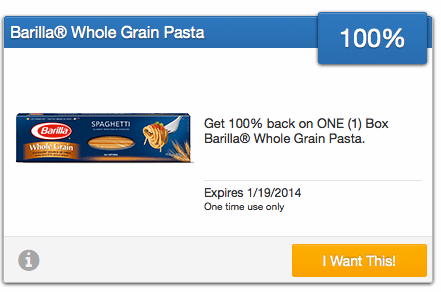 Today’s Freebie Friday deal over at SavingStar is for 100% back when you buy 1 box of Barilla Whole Grain Pasta. Valid through 1/19 only. How does this work? Once you click the “I want this” button and purchase the pasta at your linked store, you’ll receive the price you paid for it back 100%! If you’re not a Saving Star member, sign up HERE. If you can’t find the freebie offer, look at the top banner for the Freebie Friday advertisement. While supplies last! Remember, SavingStar coupons do not come off directly at checkout but are later placed in your account and you can cash out for money and gift cards. Be sure to clip them to your card before they reach their limit! Bath & Body Works: Free 3oz Body Lotion Coupon! “Like” the Bath & Body Works Facebook page to request a free 3 oz bottle of body lotion. Click “Get Offer” to claim your coupon. You’ll receive an email that you can print or show from your mobile device. https://savvywifehappylife.com/wp-content/uploads/2016/09/SavvyWifeHappyLife-logo-2.png 0 0 Brandi https://savvywifehappylife.com/wp-content/uploads/2016/09/SavvyWifeHappyLife-logo-2.png Brandi2014-01-17 11:27:402014-01-17 11:27:40Bath & Body Works: Free 3oz Body Lotion Coupon!